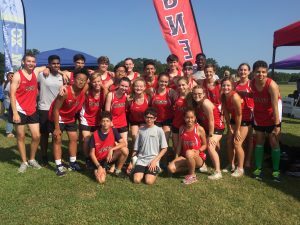 Cross country is an open bench sport; any student can join. The season starts the beginning of August and ends mid November. During the school year, practices will be held after school M-Th and also on Saturday mornings. Athletic Sport Packets should be completed and turned in by May 20th for returning runners. New runners will need to turn in the packet by the first official day of practice (usually the first day of school). Once school starts, you CANNOT practice with the team until all forms are turned in. A summer running program is very important if you want to have an aerobic base when the season begins and also if you want to be competitive. 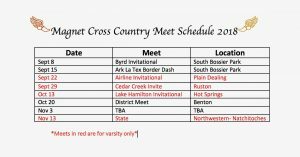 A summer schedule is available for every level of individual training, and group runs will be set up during the summer for fun and camaraderie. For more information about summer training, or if you have any questions, please contact Coach Denise Cook at 318-393-9213.